For anyone starting on the rewarding journey into computer networking, Packet Tracer is an indispensable learning tool. If you’re planning to take the Cisco Certified Network Associate (CCNA) ) exam, you must practice on the Packet Tracer networking simulation software from Cisco. On Cisco’s Networking Academy web site, the latest 64-bit version of Packet Tracer is available for both Linux and Windows for free. So I headed to Cisco’s Packet Tracer Download web site and downloaded the Packet Tracer 7.2.1 tarball for Linux. Before you can download Packet Tracer, you must register with the site. For the purpose of this post, I downloaded Packet Tracer 7.2 to a 10-year-old Dell 780 desktop PC running Linux Mint 18.3. I extracted Packet Tracer 7.2.1 into the same folder in which I had downloaded the file. Now that you have downloaded the Packet Tracer software, fire up your terminal and extract the software (see command below). Now that we completed the extraction, let’s take a quick look at the folder. So let’s move to the next step: Running the install script. I did not encounter any major issues in installing Packet Tracer except for a minor bump when the process stopped momentarily and asked for my sudo password to copy the files into opt/pt. ALL OR USE THE SOFTWARE. I. DISTRIBUTION RIGHTS. The terms in this Section I (Distribution Rights) of the Agreement apply solely to any Cisco Networking Academy instructor, administrator or other person or entity approved in writing by Cisco Systems, Inc. (each, an "Instructor") to distribute and use the Cisco Packet Tracer software and related documentation (collectively, the "Software") in accordance with the terms and conditions of this Agreement. Cisco, Cisco Systems, and the Cisco Systems logo are registered trademarks of Cisco Systems, Inc. in the U.S. and certain other countries. Any other trademarks mentioned in this document are the property of their respective owners. Voila, Packet Tracer 7.2 is now installed on my Linux Mint PC. After rebooting the system, I was able to launch Packet Tracer and get it to work without any issues. But if you’re like me and want to do more with less, you can set up an alias by opening the .bashrc file with nano or vim and inserting alias pt=”packettracer” at the end of the file, save and close it. Don’t forget to run source ~/.bashrc so that you don’t have to close the terminal for the new alias to work. The next time you want to launch Packet Tracer, just type pt instead of the longer packettracer on the terminal. Overall, I did not encounter any showstoppers in the process of downloading, installing or using Packet Tracer 7.2.1 on my Linux PC. As you can see from the Packet Tracer image at the top of this post, I even moved a PC and switch into the logical work area and hooked them up with a console/rollover cable. 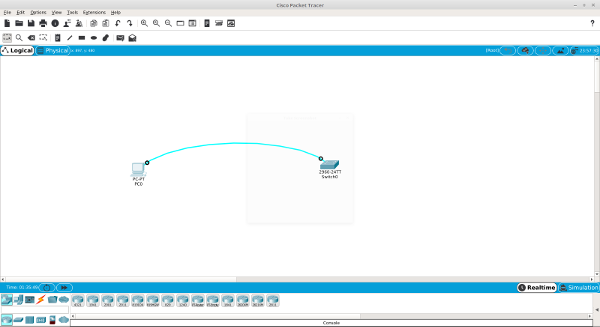 Getting Packet Tracer 7.2 on my Linux desktop PC took about five-minutes. Since Linux Mint is based on Ubuntu, Packet Tracer should work on Ubuntu too. One of these days, I’ll test Packet Tracer on my CentOS 7 desktop and see how the process goes.